In two series and over 20 films, Harry B Parkinson and Frank Miller, the directors of Wonderful London, created travelogues of different aspects of city life for cinema screenings. Aimed at exploiting the popularity of the print magazine of the same name, they were produced on a budget, but told with wit and flair. They particularly liked to highlight the contrasts in the capital, East End and West End, rich and poor, natives and immigrants – often looking beyond the stereotypes to show surprising views of the city. Painstakingly restored by the BFI National Archive to reinstate their original tinting and toning, and with new piano accompaniments, the six films on Wonderful London offer a fascinating glimpse of London life during the silent era of the mid-1920s. Featuring some of the most evocative sights of the capital, they also reveal lost images that our generation will never have seen before. After a sold out screening at the 2011 BFI London Film Festival, they now come to DVD, along with six additional films and an illustrated booklet of new essays by contemporary London commentators. Travelling from Chelsea to Hackney and taking in the familiar landmarks of London town – Buckingham Palace, the River Thames, Big Ben, Tower Bridge and St Paul's Cathedral, Wonderful London also reveals the unknown nooks and crannies and parts of London rarely filmed; the poorer, over-populated districts of Clerkenwell and Whitechapel and the original Chinatown of Pennyfields in Limehouse. There are glimpses of buildings we can no longer see on the ground; the long-gone Crystal Palace and the recently vanished gates of White City, where London's first Olympic stadium now lies under the Westfield Shopping Centre; on a boat trip up the Thames we can see Fred Karno's legendary ‘Karsino'. We can also take a trip through working-class London on a barge from Limehouse to Paddington Basin, via Camden and King's Cross. By bus or tram or foot, we can observe the thronging Sunday street markets and wander down the little alleyways, past the pubs and law courts – buildings that Dickens knew. And most poignantly, we can see a past generation of Londoners going about their business, complaining about the roadworks or looking with curiosity at us through the camera lens – all gone now – but strangely like the Londoners of today. The world-renowned silent film pianist John Sweeney has recorded the new piano accompaniments featured on the DVD. 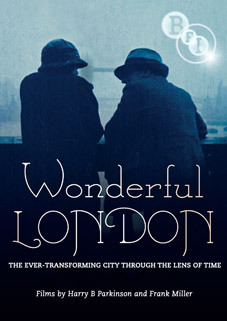 Wonderful London will be released on UK DVD on 23rd July 2012 by the BFI at the RRP of £19.99. llustrated booklet with an introduction by BFI curator Bryony Dixon and new essays by Sukhdev Sandhu, Jude Rogers, Iain Sinclair and Michael Rosen. There will be a Wonderful London launch event at the BFI Southbank on Wednesday 18th July at 7pm. Smoke: A London Peculiar and the BFI present a special screening event to launch the Wonderful London DVD, with live soundtrack by Saint Etienne's Bob Stanley and Smoke: A London Peculiar editors Jude Rogers and Matt Haynes.